Many students studying French look to take a French course in Geneva, Switzerland. Studying in Geneva offers many benefits and there are a variety of schools and courses from which to choose. Why Take a French Course in Geneva? There are several advantages to studying French in Geneva. Many French students choose to study there in conjunction with other studies they might be doing. Geneva boasts many technological research centers and young interns are often looking to get in some French study in addition to other projects. In this case, Geneva makes an excellent choice. 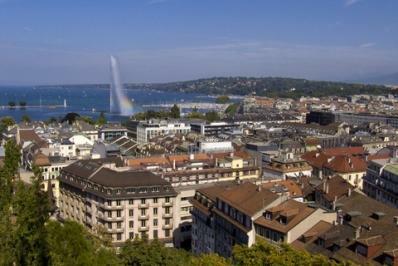 In addition, Geneva boasts a thriving international community with about 40% of its inhabitants being foreigners. This is a great opportunity for those studying international business to be immersed in a language, and be exposed to a variety of ideas and cultures at the same time. You have several options when it comes to finding a French course in Geneva. Bell Switzerland specializes in training professions who work in international settings. The school collaborates with many international organizations for language training. One thing that makes them very successful is the small class size. You can arrange for private tutoring, or classes of no more than six participants. Altera Lingua works with small groups of students to achieve fluency in French. The school offers a variety of French courses in Geneva, ranging from intensive summer courses to corporate courses for your business. All trainers are mother-tongue speakers and the school uses a variety of approaches to help students learn. ASC International House is one of the schools in Geneva that offers courses in French to school-aged students as opposed to just adults. It boasts a well-known reputation for achieving results. Their pedagogical philosophy is that each student is unique and, consequently, the language learning experience should be tailored to fit each individual learner. ELFI stands for ''École de Langue Française et d'Informatique''. It is a school for adults who want to learn French and as such, ELFI offers a variety of certificates and diplomas. The school offers comprehensive leveled instruction from beginner to advanced study, and focuses on individuals who have to achieve language proficiency for further studies or for job requirements. For college students seeking a study abroad experience, the University of Geneva offers summer courses. Many graduate students come to take part in their translation and interpretation seminars, but the University offers summer opportunities for those who want a general summer course as well. Regardless of where you are in your journey to learning French, chances are there is a course in Geneva that will suit your needs. Being an international center for business, with world organizations like WHO and the Red Cross being located in Geneva, in addition to the city being a major center for technological advancement; there are numerous opportunities for language study. Be sure to get a sense of the type of students the school typically serves. While most schools offer a variety of courses, it is typical that they are used to dealing with one type of clientele, be it high school students, graduate students or professionals needing a second language for employment. A school's typical clientele will influence how they teach the language and could influence your experience.